Exciting things have been happening in the real estate market in South Florida, but they all pale in comparison to the latest project from world-renowned architect Renzo Piano. Eighty Seven Park in Miami Beach is the only building in South Florida designed by this master architect, an exclusive opportunity featuring 68 villas bringing together fluid design, cutting edge architecture, and the beautiful natural landscape. Known for his work on the Kimbell Art Museum in Fort Worth, and the Shard in London, Eighty Seven Park aims to find the perfect balance of shadow and light, simplicity and complexity. 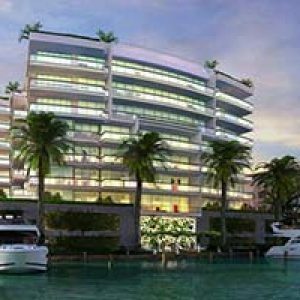 This 16-story beautiful tower, located between parkland and the Atlantic Ocean, has units ranging from 4,000 to 7,000 square feet. Eighty Seven Park is truly for those looking for a different living experience in the vibrant North Miami Beach neighborhood. 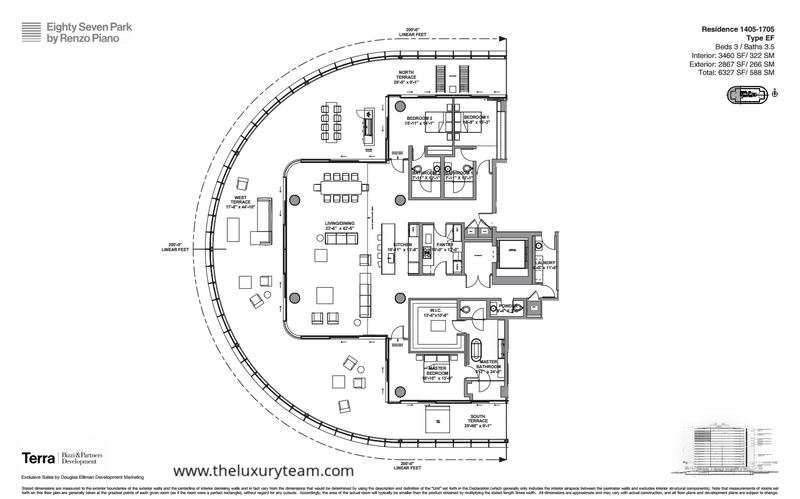 Residence 301-1201 Type A features 3 bedrooms and 3.5 bathrooms at a total of 4,136 square feet of living space. The unit is located at the corner of the building, meaning it features an expansive wraparound exterior terrace, spanning 125 linear feet. 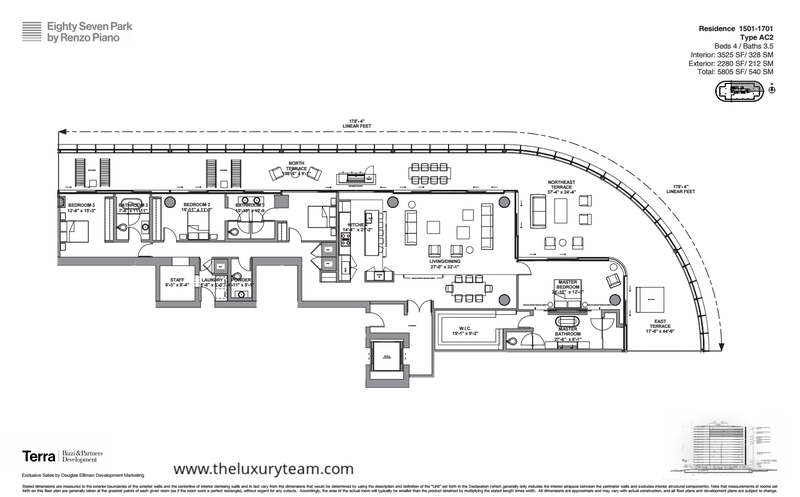 The unit features three distinct terrace areas for a total of 1,715 square feet of outdoor living space. 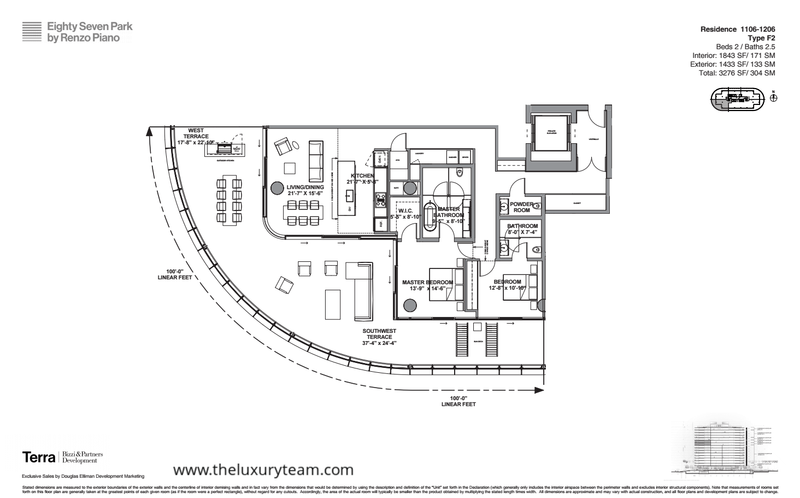 Residence 302-1002 Type B offers a similar expansive floor plan as Type A with 4,182 total square feet of living space, 3 bedrooms, and 3.5 bathrooms. The combined living/dining areas spans almost 800 square feet alone, and all bedrooms including the living/dining area have direct access to one of three expansive terraces. Residence 403-1203 Type C offers a more economical value at Eight Seven Park, but with plenty of space for luxurious single family living. 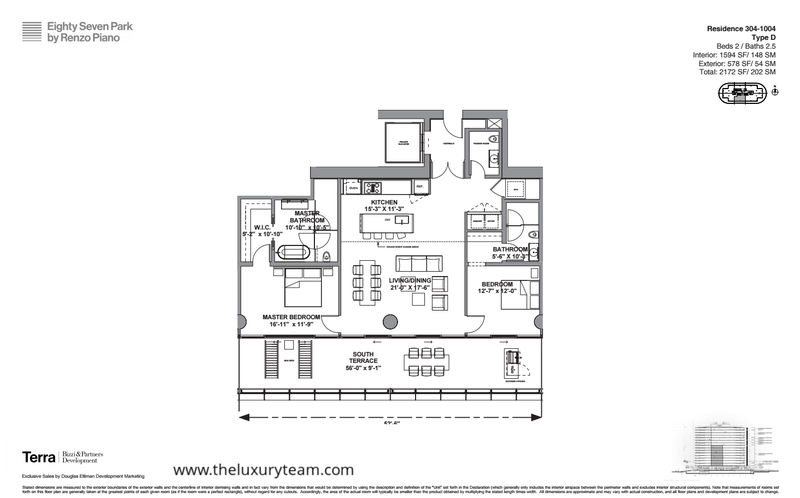 This 1 bedroom, 1.5 bathroom unit features 1,018 square feet of interior space and a total of 1,582 square feet. Residence 304-1004 Type D provides a nice mix of size and value featuring 2 bedrooms and 2.5 bathrooms. The South facing terrace is 56×9 feet and includes a summer kitchen, dining area, and lounge area. Master Bedrooms feature expansive 5×10 walk in closets. 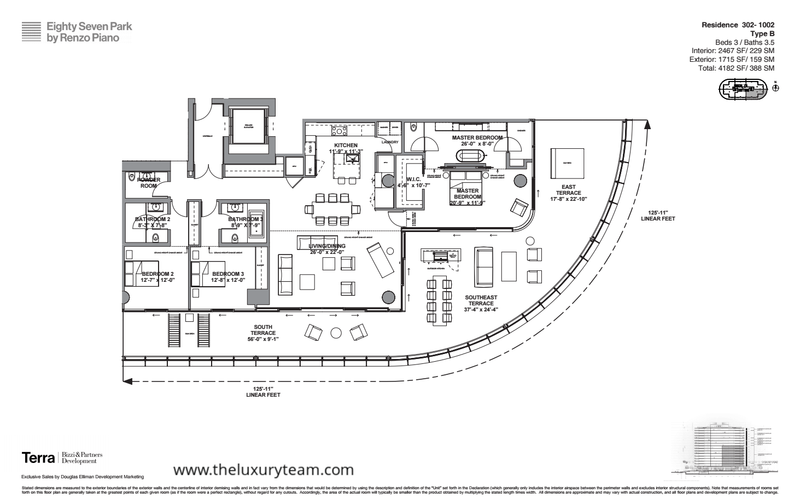 Residence 405-1205 is another “corner” floor plan, similar to Type A, but is facing the Northwest. 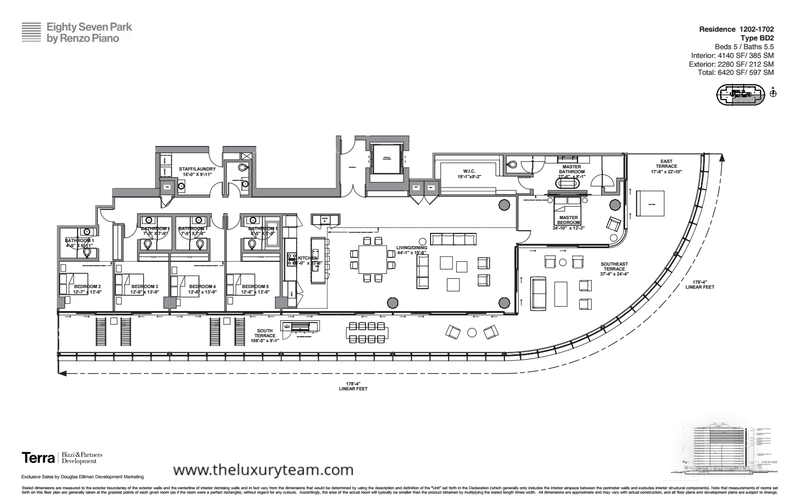 The unit is home to 2 bedrooms and 2.5 bathrooms, at a total of 3,087 total square feet of living space. The wraparound terrace has 100 linear feet of wraparound railing and a variety of angles and views for every season. 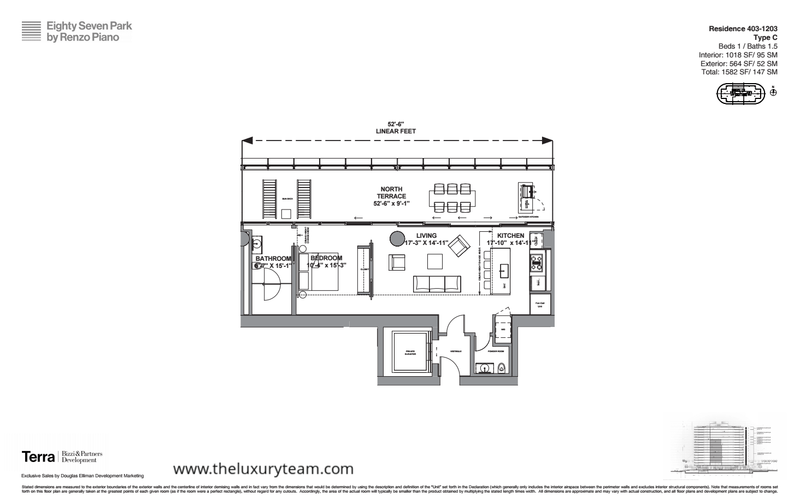 Residence 1106-1206 Type F2 is a 2 bedroom, 2.5 bathroom luxury residence featuring 3,276 total square feet of living space. The unit faces the South West for spectacular sunset views over the Biscayne Bay. This unit offers a whopping 1,433 square feet of outdoor living space, close to half of the entire unit. Residence 1405-1705 Type EF is a larger 3 bedroom, 3.5 bathroom luxury residence that features beautiful views from a wraparound terrace. Residents of this unit will have views of the South, West, and North sides of the building. The Living and Dining Room is conjoined in a massive 22 x 42 foot living area which immediately greets your guests from the private poyer entrance. 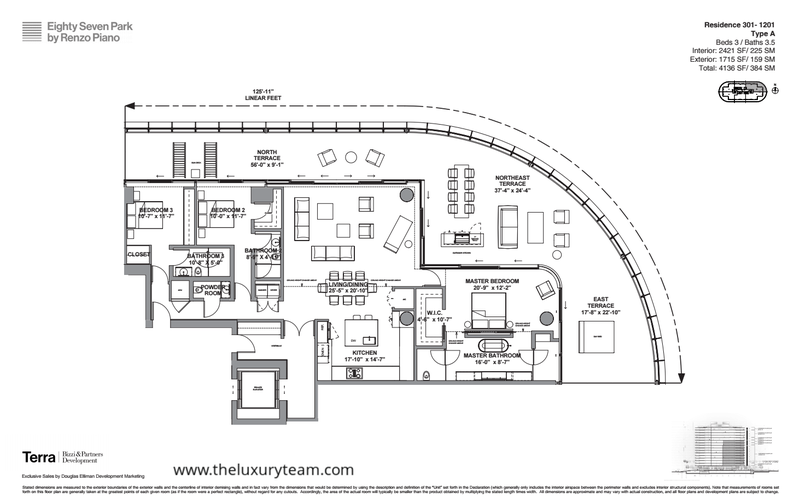 Residence 1202-1702 Type BD2 is one of the larger and exclusive penthouse residences in all of Eighty Seven Park. Miami beach views come standard! This unit features 5 bedrooms and 5.5 bathrooms and is both SOuth and East facing, meaning you can watch the sun rise and set from the expansive, 2,280 square foot terrace. Located on the North East facing corner of the building, Residence 1501-1701 Type AC2 offers 4 bedrooms, 3.5 bathrooms, and a total of 5,805 square feet of living space. 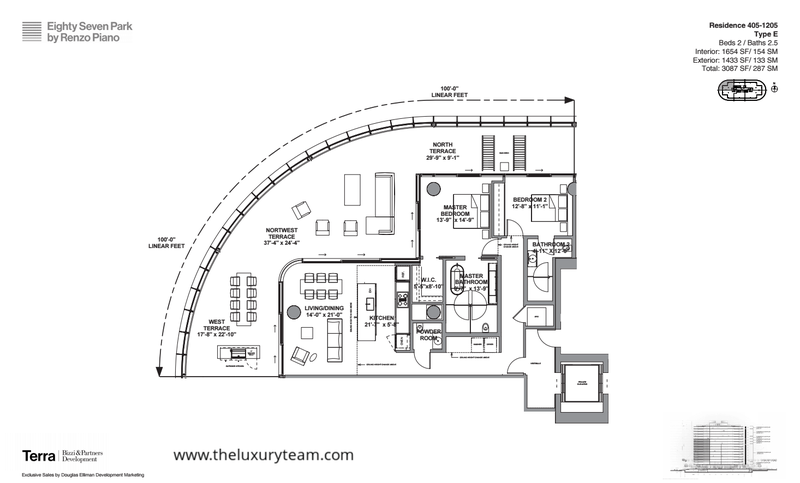 This linear floor plan provides seamless access to the terrace from almost any room in the residence. Developers Terri and Bizzi & Partners are excited to announce this new project, located at 8701 Collins Ave, right in the epicenter of dining, entertainment, nightlife, and culture in South Florida. Natural overtones are built into each and every residence at the Eighty Seven Park condos with countertops and finishing featuring American Oak, Italian Stone, and crystal clear walls of floor to ceiling glass. The elliptical architectural structure of the tower allows for expansive outdoor terraces, with plenty of beautiful views and outdoor living space. Eighty Seven Park features a series of outdoor open living spaces, lounges, and pools. Its lavishly landscaped “endless” garden provides a seamless transition into city parkland. The lobby provides 24-hour security and concierge as well as the Enoteca bar, serving botanically inspired drinks. All residents and guests also have access to a full library with carefully selected books and magazines. The sleek design of the outdoor waterfront pool is designed to impress aesthetically as well as provide a place for you to hang you and bask in the luxury that is Eighty Seven Park. Twenty four hour towel and drink service awaits you as you relax in the sun or in a private covered cabana. In addition to full drink service, the beachside Fugo bar is a great place to pull up a stool and enjoy a high-end botanical concoction. What’s in the area of Eighty Seven Park? Adjacent to the newly-invigorated city park, Eighty Seven Park is just steps from miles of jogging, walking, and biking trails topped with dunes and sea grape bushes. Just a few minutes from downtown Miami and Fort Lauderdale, Eighty Seven Park gives you plenty of options for entertainment. Also located just minutes from Fort Lauderdale and Miami International Airports, you’ll be able to easily get where you need to be. It is located right near Miami Beach at: 8701 Collins Ave, Miami Beach, FL 33154. You may not be able to see private areas without an appointment. Our condo agents can help you get an appointment to view open units. What if I have more questions about Eighty Seven Park condos for sale? Talk to our agents if you want to buy a condo at Eighty Seven park or learn more about it. We’re ready to talk to you.